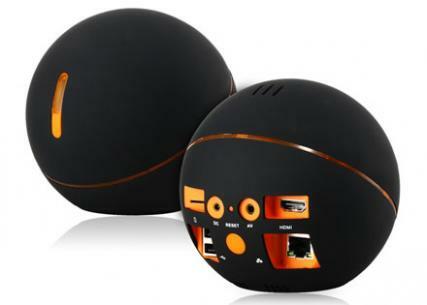 Ball shape RK3188 Quad core Android 4.2 TV Box, top hardware configuration, 1G/2G DDR3 RAM + 8~32G NAND Flash, AV + HDMI output etc. Independent R&D, Independent copyright Built-in Ari Mouse Module. Compared to other TV Box using USB Dongle to support wireless mouse, Air mouse, giayee’s air mouse controller is more stable with lower cost. Support audio talk via third party application, such as SKYPE, QQ etc. Built in Cara OK application, enjoy the Cara OK with your family at home. Built-in high sensitive gravity sensor and gyroscope in remote control，Android system in-depth customization , specifically designed remote control for the game according to human body engineering principle, make it a unique TV BOX that support android Motion Sensing Game. Motion sensing games：Riptide GP、3D Bio Ball…..
* Built-in G-sensor and Gyro, support motion sensing game, such as temple run, Riptide GP etc. * Built-in Microphone, Support SKYPE or QQ audio talk, voice input and voice search. Interface * 1’x AV Output. * 2’x USB HOST, Support Camera, Mouse, Keyboard, U-disk etc. * 1’x Micro-SD card slot, support 32G Max.